August 30, 2014 Nefer Khepri, Ph. D.
Deck Review: The Eclectic Gypsy Cards. A proficient card deck creator, Lynn Boyle now has fourteen decks to her credit, all of which are available for sale at her Etsy shop. Price on all her decks (to date) is $25 each with shipping being $2 in Australia and $6 overseas. Dollars are in Australian dollar amounts. I have been using Lynn Boyle’s Eclectic Gypsy Cards for a good while now and I really enjoy them. The deck consists of 36 poker-sized cards. Since there are 36 cards here you can use this much the same way you would use a Lenormand deck, but this is not a typical Lenormand deck. There are some card images and interpretations the Eclectic Gypsy Cards hold in common with Lenormand, most notably the Anchor, birds, Bouquet/Flowers, Dog, Fish, Fox, Heart, House, Key, Letter, Lily, Lucky Clover, Man, Ring, Ship, Snake, Star, and Woman. Card titles that will not be familiar to most Lenormand readers are: Broken Bottle, Broken Heart, Broken Mirror, Butterfly, Clock, Death & Rebirth, Dove, Hand of Fate, Handshake, King, Knife, Oracle, Owl, Phoenix, Poison, Sunflower, Violets, and Wheel. Of these cards, two can be found in the Kipperkarten card deck: Broken Mirror and Handshake. The Eclectic Gypsy Cards have a nice balance between positive, negative and neutral cards. The way I see them, I divided the deck up into 22 positive, 8 negative, and 6 neutral cards. The images are very clear cut and easy to understand with most rendered in bright colors, which would make sense as this is a Gypsy deck and most associate bright colors with that culture. The card title is clearly visible on each card, but these cards do not include numbers or playing card inserts. Accompanying documentation for the Electric Gypsy Cards consists of a 4-page pamphlet of interpretations printed out on A4-size paper. Interpretations of both a positive and negative nature are included for each card. The cards arrive in an organza drawstring bag and Lynne takes great care in packing them for international shipping. My box arrived in Texas all the way from Australia and the deck was very well packaged and arrived safe and sound, despite a lengthy delay caused by the local branch of the post office, but that had nothing to do with Lynn, but had everything to do with local postal employees being incompetent. Eclectic Gypsy Cards, Copyright Lynn Boyle. Self-published. For those of you who read Lenormand cards, I did not pre-select a significator. All five cards were drawn at random. I note that I was concerned about my daughter’s success this academic year and the Star card is in the central position where the significator would normally appear. The Star means goals, hopes and success. It matches my concern regarding my daughter. Ring represents a partnership or commitment. That is definitely what happens when a child attends school, at least one who is interested in learning. They make a commitment to attempt to do the best they can in all their classes. I have had talks with my daughter over the summer about this issue since last year she was picky about which homework assignments she would actually complete. I told her I expect her to be more committed this year and that receiving zeros as grades will no longer be tolerated. The Ring reflects the topic of these conversations. Ship is moving forward. My daughter is now a Sophomore so she is definitely moving forward, and I also see Ring + Ship combined as meaning that her increased commitment to doing well will start to take her places. Star in the center represents my wishes for her to be successful. I also see it as representing her being surrounded by all the positive energy I send her daily to protect and help her in all of her endeavors. Over the summer I also taught her how to better connect with her angels and spirit guides so for me, The Star represents the guidance she will receive from the new connections she has made with her spiritual team. Ship + Star to me means moving forward toward new blessings. I take this as a very positive card combination. King is a card not found in Lenormand decks. Lynn Boyle defines King as meaning: “wealth, power, privilege, & position, success & prosperity, independence, having influence, rules and regulations … thinking straight, level headed & analytical … being a leader.” Given the context of my question, King represents my daughter taking more control over her academic life, becoming more determined to succeed. I can already see signs of this. It is now the second day of school & she came home with homework, told me about it and immediately sat down and did it. I tried not to allow my mouth to drop open when I saw what she was doing. Normally I have to really get after her to do her homework and she whines about it. This is a different child from last year already! Star + King represents success coming from someone being a hard worker and dedicated to what they are doing. I am hoping that the early indication I have already had from my daughter as she quickly completed her Geometry homework today is an indication that she is taking her education more seriously as this card combination seems to indicate. Well, that about sums up what I’d like to have occur – for the hand of God to knock some sense into my child that her grades are important and will determine what sort of university she can attend! I’d say that looks like she will falter from time to time but that she will be knocked back on track, probably by yours truly, but hey, isn’t that a mother’s job anyway? Overall, I really enjoy using The Eclectic Gypsy Cards. They give me clear and accurate readings, plus I enjoy looking at the images. Check them out and see what the future has in store for you. 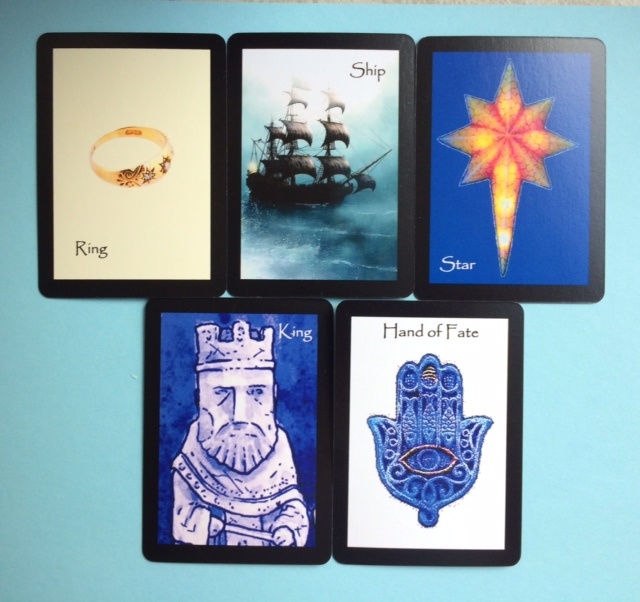 Egyptian Lenormand: my self-published deck. I have only SIX copies remaining of a limited print-run of 100, all signed & numbered. Once these are gone due to my contract with Schiffer Books I will not be able to produce anymore copies. Get them while you still can. I ship worldwide.